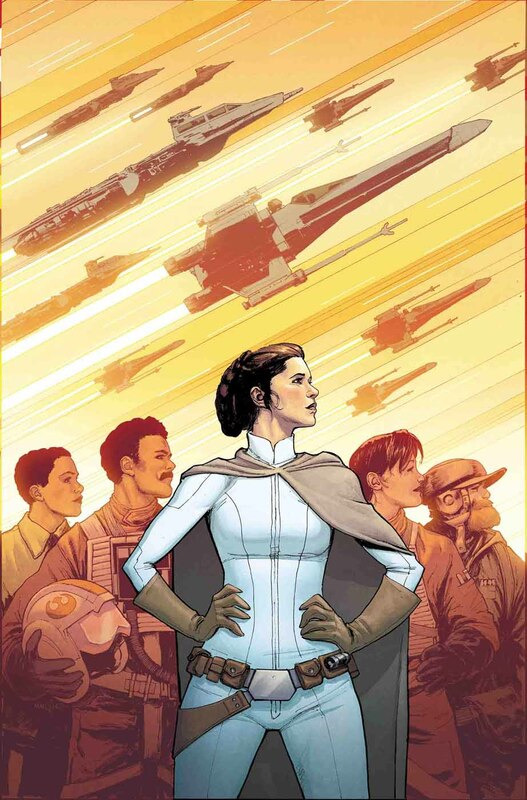 Star Wars #44 kicks off a new arc called “Mutiny at Mon Cala.” Leia has a meeting on Mon Cala with Grand Admiral Urtya, which doesn’t go so well. However it does inspire her for her next mission. The plan – break out the king of Mon Cala. The issue opens on a remote island on Mon Cala as Han, Leia, Luke, Chewbacca, Ackbar and the droids wait for the arrival of Urtya. Leia tries to convince him to help the Rebels, but he’s not persuaded. Meanwhile Han deals with an Imperial patrol, and they all run for their lives to escape. Later on, Leia and company head back to the new Rebel base, the Mako-Ta Space Docks. There, Leia comes up with a new approach to win over Urtya. There’s a mix of action, story development and entertaining dialog as this whole issue unfolds. Larroca does a good job with the artwork, and the location on Mon Cala provides lots of bright panels as they enjoy a sun lit beach side back drop. The whole story serves as a kickstarter for the next adventure which is leading to another prison break story. We’ve actually seen quite a few prison break stories already in the new Marvel Star Wars comics, so hopefully this one will have something new to offer. As is, this issue isn’t too bad. It has good artwork and an enjoyable story. I give it a four out of five metal bikinis.